Biology: a group of freshwater fish belonging to the family Percidae. 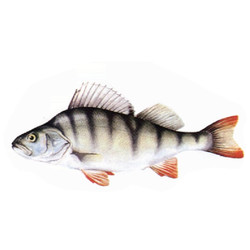 Perch inhabits deep, calm waters of lakes, reservoirs, canals and rivers. Feeds mainly on fishes, water insects, snails etc. Average size is 10-20 inches (10-25.5 cm) and weighs about 5.29 oz (150 g).